Serge Dassault’s adult life began dramatically when, in early 1944, he was imprisoned by the Gestapo with his parents and his brother at Montluc near Lyon, and then at Drancy, from where prisoners were shipped to the death camps. The Nazis thought they could thus force his father Marcel Dassault to place his aircraft designer skills at the service of the Third Reich. Marcel Dassault refused and was deported to Buchenwald in August 1944, from where he miraculously returned in May 1945. Of this tragic experience, Serge has always kept an attention to the human person, and to national sovereignty. Having graduated from the École Polytechnique and the École Nationale Supérieure de l’Aéronautique, Serge Dassault joined the design office at Générale Aéronautique Marcel Dassault in 1951. He became manager of the flight test department in 1955 and, as such, developed a large number of military aircraft (Super Mystère B2, Étendard, Mirage III and Mirage IV). Then, appointed Head of Export, he led the negotiations that resulted in the sale of Mirage III aircraft to Switzerland and Australia. Serge Dassault also launched the Mystère 20 (now Falcon jet) sales campaign in the United States. In 1963, he took over the senior management of the company Électronique Marcel Dassault, where he was appointed Chief Executive Officer on 10 October 1967. He held this position until 23 December 1986. 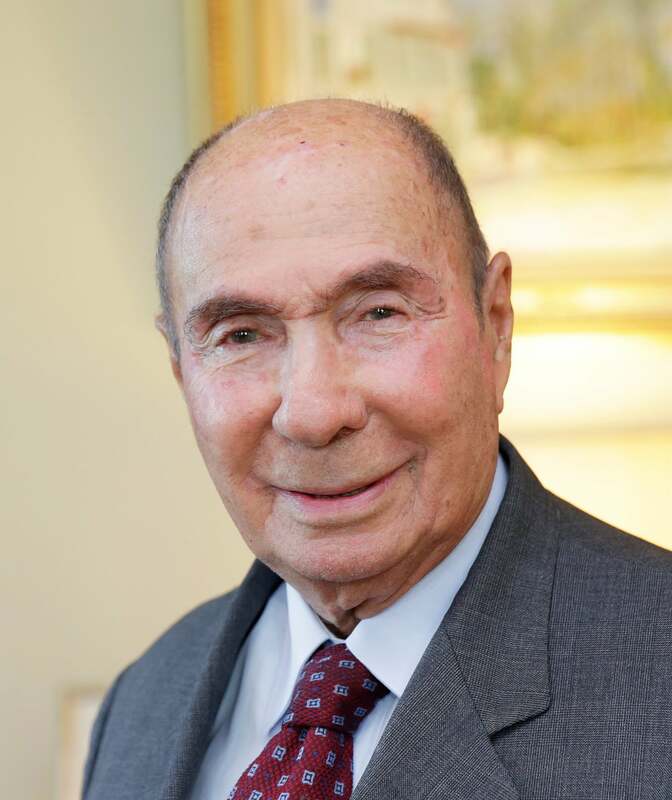 From 29 October 1986 to 4 April 2000, Serge Dassault has been Chairman and CEO of the company Avions Marcel Dassault – Breguet Aviation (which became Dassault Aviation in 1990) before becoming its Honorary Chairman. Since 2 December 1987, Serge Dassault had also been Chairman and CEO of Dassault Industries, which became the Groupe Industriel Marcel Dassault on 1 January 2000. Under his leadership, Dassault Aviation consistently developed and implemented a policy aimed at adapting to new market realities. He led the Company to rise to the challenges of the 21st century. Under his terms emerged innovative aircraft meeting the new customers’ requirements, notably the modernized Super-Étendard, the Mirage 2000-5, the Mirage 2000D and Rafale for combat aircraft, and the Falcon 2000, the Falcon 900EX, the Falcon 50EX, the Falcon900C and multi-mission Falcons with the Falcon family of business jets. All these programs have ensured the development of the company’s excellence and opened the way to many successful challenges: the export of the Rafale fighter, the first European combat drone demonstrator nEUROn or the widening of our range of Falcon business jets with the introduction of the 7X, the 8X and now, the 6X. Under his impetus, and with the help of Charles Edelstenne, he restructured and modernized the industrial tool while maintaining the company’s social model. Notably, Serge Dassault ensured that very employee could benefit from the efforts made by distributing an incentive and a profit-sharing each year far in excess of what the law provided for. In 1975, after serving as Treasurer of the trade union Union Syndicale des Industries Aéronautiques et Spatiales (USIAS), which subsequently became the Groupement des Industries Françaises Aéronautiques et Spatiales (GIFAS), Serge Dassault was appointed General Commissioner of the International Paris Air Show in Le Bourget. As such, he successfully coordinated the organization of ten Paris Air Shows. In 1998, he was elected aircraft manufacturer of the year in the awards of the American magazine Aviation Week & Space Technology. Chief Armaments Engineer (reserve corps), a graduate of the Centre de perfectionnement des affaires business school and a former auditor of the public administrative establishment Institut des Hautes Études de Défense Nationale (IHEDN), Serge Dassault has also been awarded the aeronautics medal and is a grand officier of the Legion of Honor. Beyond his works as a CEO, the employees of Dassault Aviation salute his passion for aeronautics, his human vision of entrepreneurship, and the relentless support he provided, as a majority stakeholder, to the Company’s strategy. Such passion, human vision and management stability are the core strengths of Dassault Aviation. They will remain so tomorrow. “Serge Dassault has devoted his life to aeronautics and the French industry. He has defended with passion and determination Dassault Aviation and its employees, with the sole ambition of long-term viability of the French wings”, said Eric Trappier, the Chairman and CEO of Dassault Aviation. Our deepest condolences go out to his wife, his children and grand-children. We, the great family of Dassault Aviation’s management, engineers, technicians, employees and workers, share their loss. On February 5, 1982, at the request of the shareholders, Électronique Marcel Dassault became Électronique Serge Dassault, until 1998, when the company merged with Thomson-CSF. Press release " Dassault Aviation pays tribute to Serge Dassault"
Communiqué de presse "Dassault Aviation rend hommage à Serge Dassault"